BRITISH, AS THEY SAY, IS BEST. And if you want the best of British music you should also watch out for the young, up-and-coming artistes known collectively as Nightvision who definitely deserve to be noticed. This hard rock band comes from Lincolnshire and has now released a very creditable album, As The Lights Go Down  packed with "exuberant, crisp, crunching guitar riffs, soaring, wide ranging vocals, thunderous melodic bass lines and powerhouse engine room drumming". A very notable sound from four excellent young musicians who have embraced influences from their (metal and hard rock) past, injected tons of energy and enthusiasm and created their own distinctive brand of high-energy hard rock music in the process. Having spent much of April out on the road, with gigs up North in Manchester, Lincoln and York before dipping down to Nottingham and London, Nightvision has been able to air the mouth-watering ingredients of their wonderfully 'right on' debut album As The Lights Go Down that takes full advantage of the creative sparks that fly between these guys as soon as they get together. 2003 was the foundation year for this home-based 'tight, eight-legged hard rocking groove machine' that is Nightvision, when twenty-three-year-old guitarist Neil (Bolda) Wallis and drummer Daryl Hocking (also 23) first got together to play music, bonded by a shared love of Iron Maiden, Queen, Metallica, Guns 'n' Roses, etc. 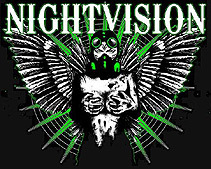 Having watched the first line-up of Nightvision playing for 18 months, Daryl's 19-year-old brother Dean was persuaded to join the band in 2005 when the previous bass player quit. "As me and Daryl didn't always see eye to eye, it just didn't seem a sane thing to do, but after much discussion, Bolda and Darryl asked me to join and make it my main priority, so I accepted the offer," says Dean. As history has shown, the dynamic created by two brothers in a band can go one of two ways  either disastrously or compatibly. Happily, it turned out the brothers thrived creatively and there was just one thing missing with Nightvision: a talented vocalist and front man. At the beginning of 2006, the final jigsaw piece was in place. Extrovert, energetic vocalist Dave McKee walked into the group's audition room, radiating all the self-confidence of a natural-born front man. Twenty-four-year-old Dave had cut his teeth on stage as a professional actor and guitarist in a national professional touring theatre company and was keen to indulge his love of the heavier side of life and music. His vocal style, which "ranges from extreme extended highs associated with power metal 80's bands to a growl that would give James Hetfield a run for his money" was an ideal musical match. Dave oozes personality and basks in the limelight: "I love gigging  any kind of performance really, any excuse for me to be playing on stage to an audience!" The perfect find  especially as the four musicians gelled instantly and quickly assumed an enviable group consciousness, honing down their craft headlining local pub gigs and supporting the likes of Diamond Head, Fozzy, New Generation Superstars, Sweet Seduction, Kid Ego, From Almost The End, The Imperial Vipers, Patchwork Grace, Disarm and many more. At the end of 2008, the band signed to Rocksector Records and recorded As The Lights Go Down in Axis Studios in Doncaster with producer Matt Ellis  the album was released on 6 April (2009). As the publicity machine says: "Turn the volume up to 11 As The Lights Go Down and immerse yourself in this truly excellent debut album�"
 Nightvision's As The Lights Go Down is out now on Rocksector Records (distributed by Plastic Head). 1 After Dark | 2 Sick And Tired | 3 Something Better | 4 Mine, All Mine | 5 Love Ain't Cheap | 6 Sentenced To The Gallows | 7 Nightmare | 8 Enough Of You | 9 Demons | 10 King For A Day | 11 Carnival | 12 Promiscuity.